Mayor Rahm Emanuel and city of officials provided an update on the city’s response to the record-cold temperatures and heavy snowfall that struck Chicago. The Department of Streets and Sanitation deployed its full fleet of more than 280 snow plows and salt spreaders, 26 smaller four-wheel plows and 30 quick hitch plows attached to garbage trucks to remove snow and spread salt. _O’Hare Airport has received more than 34 inches of snow this winter, including almost 23 inches since Dec. 26. Plows will continue to work on side streets, but conditions on side streets may vary with the volume of snow and high winds that occurred with the recent weather system. 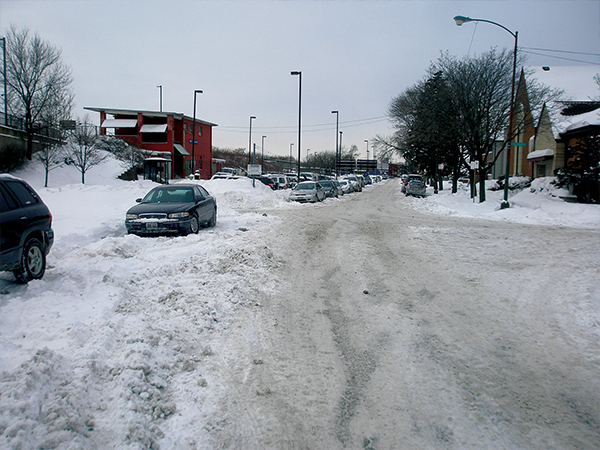 "Snow removal vehicles continue to work nonstop as blowing snow and freezing temperatures impact Chicago roads," Streets and Sanitation commissioner Charles Williams said. "We are focused on ensuring main arteries remain clear and safe for motorists and emergency vehicles while also plowing side and residential streets to make them safe and passable for residents." "We remind residents to take precautions and to call 311 and we will connect you to city services and resources for assistance," Office of Emergency Management and Communications executive director Gary Schenkel said. The Department of Family and Support Services extended the hours at its six community service centers and six senior centers during the cold spell. The department also made arrangements with shelters to increase outreach efforts to assist residents in need, adding one outreach team per shift and checking on the homeless. Chicago Public Library branches also serve as warming centers. The Chicago Fire Department recommends that if residents use space heaters, they should only use heaters that are UL-certified as safe, should never use an extension cord with a space heater, which can cause the cord to overheat and burn, and should never allow a space heater within 3 feet of anything that can burn. "Sadly, we have found that fires have started because children have moved a space heater closer to the bed for more heat after parents have gone to bed for the night," Fire Department commissioner Jose Santiago said. Fire officials also encouraged residents to check to make sure their carbon monoxide detectors are working properly. The Department of Public Health reminds residents to take precautions to stay warm and avoid hypothermia and frostbite. Residents should avoid unnecessary trips outside, and if it is necessary to go outside, wear several loose fitting layers of warm clothing. When shoveling snow, work slowly and take frequent breaks to avoid exhaustion. Be sure to winterize your home and vehicles, and keep cell phones charged with extra batteries for emergencies. The CTA experienced some delays related to weather but provided normal weekday service, and trains and buses are running on every route. Riders can get bus and train arrival information via the CTA’s web site, which can be reached at www.transitchicago.com. The Department of Buildings said that tenants who are without heat should first contact their landlord and then call 311 to report the issue. City ordinance requires that the temperature inside a rental residence is at least 68 degrees from 8:30 a.m. to 10:30 p.m. and 66 degrees at night. The Department of Water Management has repaired 40 leaks on water mains and other pipes. To avoid frozen water pipes, residents can keep a trickle of water running and allow warm air to heated areas where pipes are exposed. "Our city is confronting some of the most extreme weather we’ve seen in decades, and it’s clear that Chicagoans are rising to the challenge," Emanuel said. "I ask everyone to keep exercising good judgment and remain indoors if at all possible, to take the warnings and advisories seriously, and to check on the well-being of family, friends, and neighbors." YES will be performing at the Copernicus Center on Saturday, July 26!